A man described by Evans-Pritchard as an 'Anuak-Nuer' i.e. of mixed parentage, casting a fishing net into a river, probably the Sobat River near the wood station also photographed on the same film. 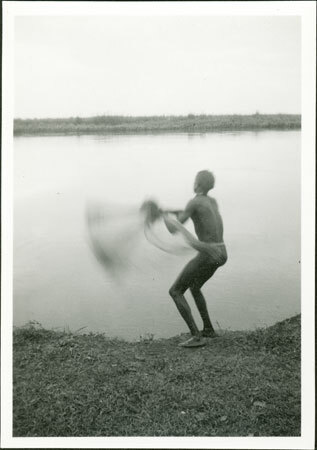 Evans-Pritchard has presumably noted the youths origins since net fishing was not practised by the Nuer, preferring the harpoon. Note on print reverse ms pencil - "40 3" & print front border ms ink - "NUER XVI/6"
Morton, Chris. "Fishing in Sobat River" Southern Sudan Project (in development). 03 Jan. 2006. Pitt Rivers Museum. <http://southernsudan.prm.ox.ac.uk/details/1998.355.753.2/>.